You can easily drag and drop photos from thumbnail list to arrange photos in the order you want them to show in a slideshow. Another way to arrange photos: 1.Tap any of photos from the thumbnail list. 2. Tap the pencil icon, a feature bar will show up. 3. Tap the third icon from left to bring up the Arrange Order window. 4. 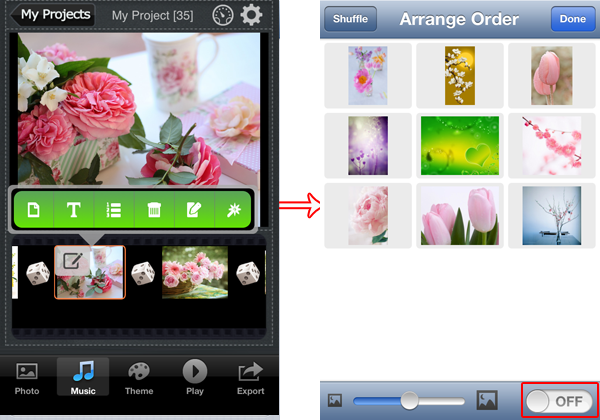 Tap Shuffle, you can choose to sort photos by name or date, or to randomize photos. Also you can drag photos to arrnage them. 5. After arranging is finished , tap Done at the right top.